Do You Need a Job as a Full-Time College Student? Between homework, finals and extracurricular activities, college can demand a lot of your time. On top of these tasks, many students choose to hold a job in order to help cover some of their expenses. In fact, according to the U.S. Department of Education, 78% of part-time students and 43% of full-time students hold a job while in college. While it may seem overwhelming, many students make it work. But is it right for you? 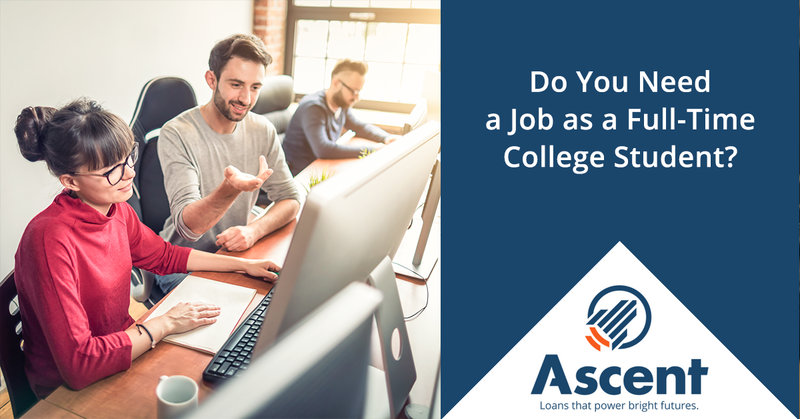 As part of our Ascent Tips & Advice series, we’ll look at some of the factors that drive students to take on work and a few important considerations to make when it comes to deciding whether or not you need a job as a full-time college student. Minimizing Debt: Perhaps one of the main reasons that students work while in school is to pay for tuition and school-related expenses. Covering these costs up-front helps to avoid the need to take on debt, which incurs additional interest costs over time. The more money that you earn, the less you’ll have to borrow to cover your classes. Our Financial Literacy tips can help you gain a better understanding of debt, income and expenses. Developing Skills: Holding a job can help you develop skills that you couldn’t otherwise learn. Time management and teamwork skills are developed to some extent in the classroom, but they take on a different meaning when you’re working to complete a professional project. Success in a classroom may mean a soaring GPA, but in the workplace success translates more directly into money. A job can teach you how to be professional and effective in a way that a classroom cannot. Job Experience: If you can, it’s best to find a job that relates to your field of study. That way, you are developing practical skills that apply to your chosen field. Relevant job experience can give a serious boost to your employability after you graduate, and can be a powerful way to set yourself apart from other graduates. Employee Benefits: Some employers offer benefits such as retirement accounts, health insurance and tuition assistance to eligible employees. Though usually such benefits are reserved for full-time employees, they are a serious incentive if you can find them. Though holding a job during school can have serious benefits (especially when combined with good budgeting habits), we also have to consider the flip side when deciding whether or not to work while in school. Burnout: When you’ve bit off more than you can chew in the work-school sphere, you run the risk of burning out. Your time and energies are limited, so you have to take care to allocate them in a wise way. Overexerting yourself to the point where your work or school life suffers doesn’t do you any favors. If you find that your studies are being seriously impacted by your work obligations, it may be time to re-evaluate your work-school balance. If you are busy around the clock and don’t have any time to unwind and relax, this may lead to burnout as well. In some cases, looking into other financial sources may be necessary to avoid burnout. Sacrificing Extracurricular Opportunities: College is a time to network, open up new doorways and build relationships. It takes time to make connections and explore new opportunities. The demands of working while in college can mean that you’ll have to sacrifice some other activities. For example, if you are a musician, you may not have the time to rehearse if you are spread too thin between work and school. With such constraints, you have to be especially judicious about how you invest your time. Though there are both pros and cons to working while in school, it ultimately depends on your situation and needs. Some students thrive while balancing work and school, while others are better suited to focus solely on their education. 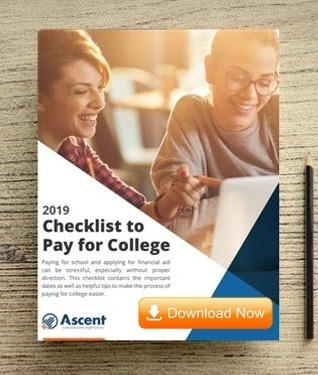 Whatever decision is best for you, Ascent has resources aimed to make your college goals happen. Check out our NerdWallet Articles for some helpful perspectives and check in with our Tips & Advice section periodically to get the latest in financial guidance. Though it takes some hard work and dedication, your educational and professional goals can become a reality, one step at a time.